Many of us that have watched Mary Poppins, or at least heard about it, know that it is a movie from Disney about a kind, sweet, but strong nanny that came one day from the sky with her miracle purse, and her talking umbrella to help family Banks with their troubles. Not many people know though, that this story is based on a very successful book, written by a bitter woman, who hated singing, dancing and all what Disney symbolizes. This story takes place during the time Mary Poppins' author P.L. Travers, traveled to USA after Disney's insistence to buy the rights of her book. This Biopic counts with the wonderful work of consummated actors such as Emma Thompson, Paul Giamatti, Tom Hanks and Colin Farrell. Directed by John Lee Hancock, and distributed by Walt Disney Studios, Saving Mr. Banks (2013) shows the involvement of the acclaimed-children-books author, P.L. Travers in a very though negotiation with Walt Disney for the rights to make a movie about her famous book “Mary Poppins”. The story is set back during two different times of Traver's life: One in the present of the author in 1961, and the other during her childhood in Australia. The cast works well together giving life to their characters. However, the ones that stand out in the film was Emma Thompson and Paul Giamatti in their respective roles as P.L. Travers and Ralph, a fictional limo driver. A note worth of mention is Collin Farrell as Travers Goff, P.L. Travers' father, who portraits a very irresponsible man, tortured by his alcoholism and delusions of grandeur. Still, in my opinion Collin doesn't shine for some reason as their co-stars do, appearing sometimes limited in his acting, looking much better in another roles that he made in the past. Tom Hanks portrays a most favorable Walt Disney's character, leaving most of Disney's complex traits outside of the role. Maybe this was done intentionally by the director, firstly to avoid an interference with the main story of P.L. Travers, and additionally to depict the renowned mogul in a more sympathetic light. 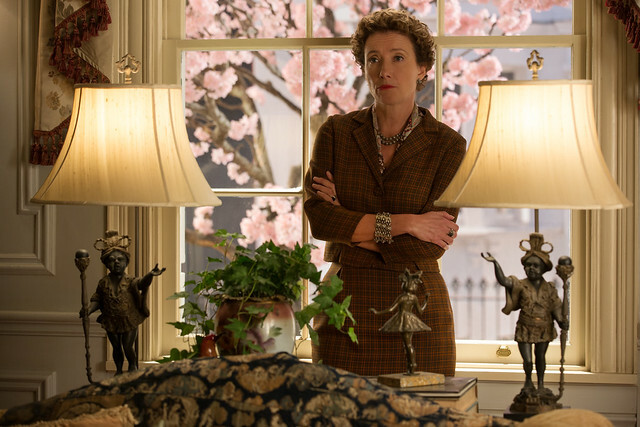 Emma Thompson on the other hand portrays a very convincing Travers, transmitting a wide range of emotions that surely will make you cry in your sit. She made a wonderful work, showing her as a resentful woman undecided between the purity of her work, and the fight with her financial difficulties. You can feel her loneliness during the film, as well as her joy, like only a masterful actress as Ms. Thompson can achieve. In addition, the chemistry between her and Paul Giamatti, will make a long-lasting impression in you as a viewer. The film music adapts most of Mary Poppins' familiar tracks, using them to dramatized the scenes from Travers childhood throughout the film. It surrounds the movie with a nostalgic atmosphere that brings memories back of the Mary Poppins film, employing the songs in a brilliant way. The script takes advantage of it, lightening the mood during the comedic scenes, and conveying more stress in the dramatic moments of the movie. The script describes in a very effective way, the childhood of the young author filled with despair and disappointment due to his father illness in flashbacks, at the same time it shows her present life in a day-to-day struggle to overcome fear, and anguish due to her troublesome past and adverse present. This is a very well done movie that it is worth the ticket's price. If you are looking for an entertaining, and very touching testimony related with one of the most beloved Disney's works, this movie will surely provide you with a good time. The movie of course is a dramatized story from an excerpt of Travers' real life, and that means, most of the things you will see on screen, may doesn't match with the reality itself. However, the film comes closer to the facts as it could be, with a tight cast that makes the story the most believable possible, without going adrift from the main narrative. I really recommend you to go and watch this film.